Download "The Indiana Trial Lawyer Association s Lifetime Achievement Seminar. 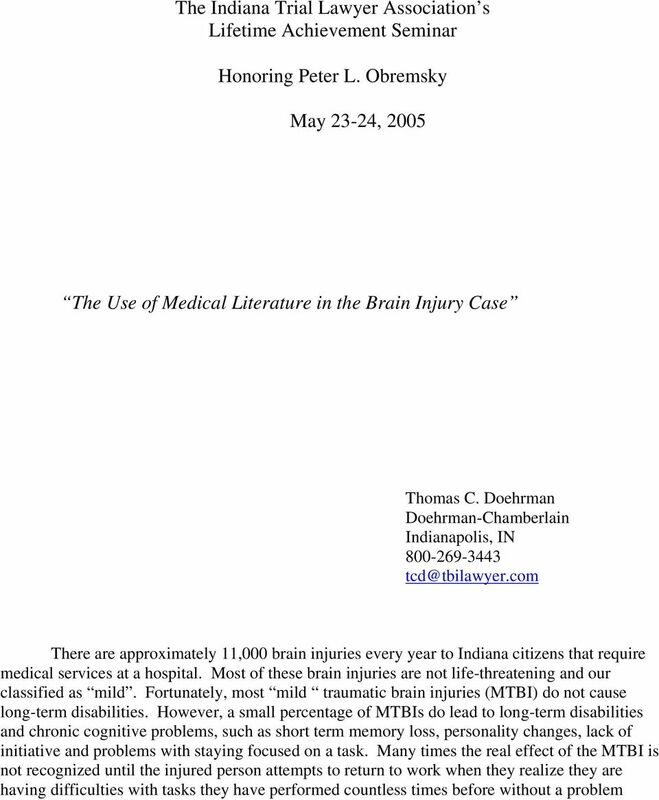 Honoring Peter L. Obremsky. May 23-24, 2005"
3 or disorientation. The ICD-9 also has a classification for Postconcussion syndrome, The Appendix to ICD-9 contains a good definition of postconcussion syndrome. 3. The American Academy of Neurology (AAN) has developed guidelines for the diagnosis and management of concussion in sports. The AAN has broken down concussions into three grades. Grades I and II, by definition, require no loss of consciousness. Report of the Quality Standards Subcommittee, American Academy of Neurology, Practice Parameter: The Management of Concussion in Sports, 48 NEUROLOGY (1997). 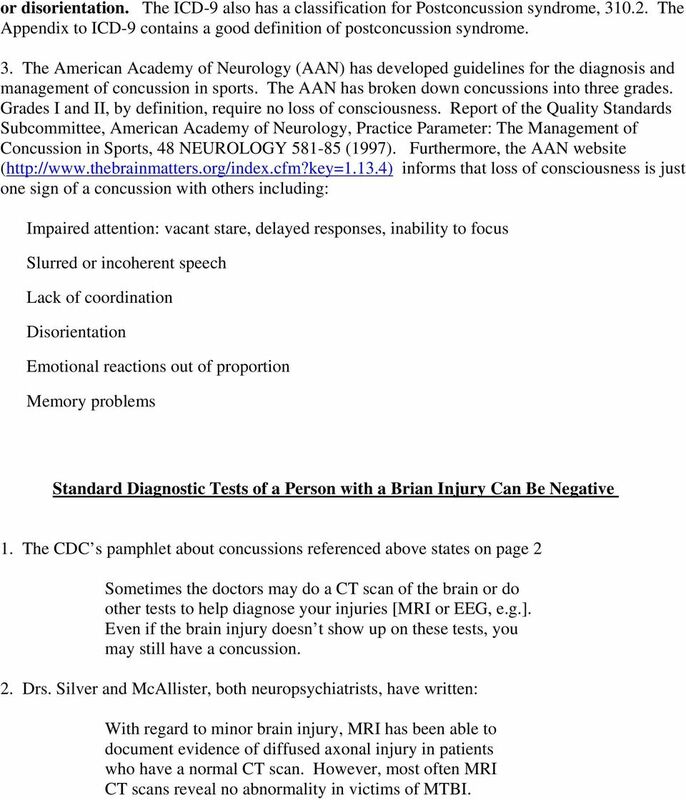 Furthermore, the AAN website ( informs that loss of consciousness is just one sign of a concussion with others including: Impaired attention: vacant stare, delayed responses, inability to focus Slurred or incoherent speech Lack of coordination Disorientation Emotional reactions out of proportion Memory problems Standard Diagnostic Tests of a Person with a Brian Injury Can Be Negative 1. 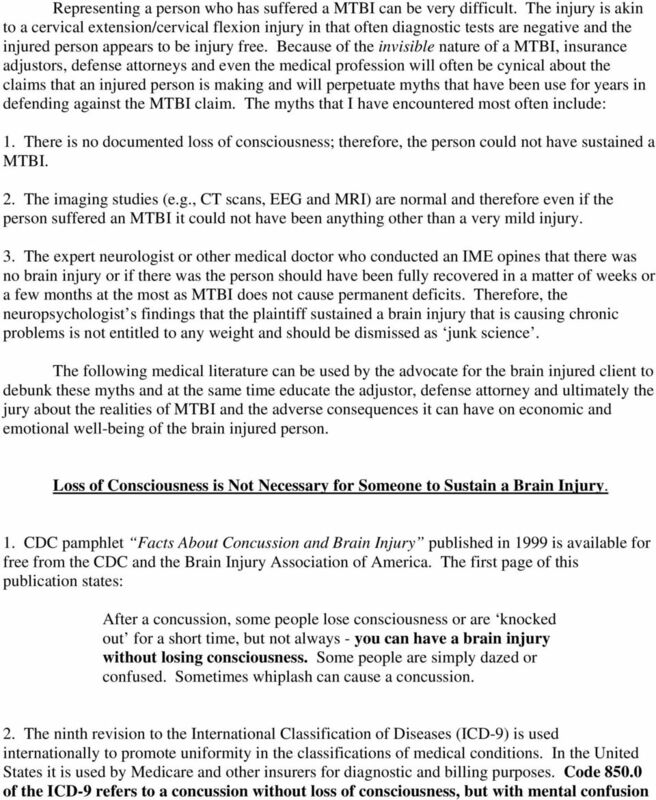 The CDC s pamphlet about concussions referenced above states on page 2 Sometimes the doctors may do a CT scan of the brain or do other tests to help diagnose your injuries [MRI or EEG, e.g.]. Even if the brain injury doesn t show up on these tests, you may still have a concussion. 2. Drs. Silver and McAllister, both neuropsychiatrists, have written: With regard to minor brain injury, MRI has been able to document evidence of diffused axonal injury in patients who have a normal CT scan. However, most often MRI CT scans reveal no abnormality in victims of MTBI. 5 three to six months after the injury. Persistent symptoms and cognitive deficits are present in a distinct minority of patients for additional months or years...contrary to popular perception, most patients with litigation or compensation are not cured by a verdict. Thomas W. McAllister, Mild Traumatic Brain Injury and the Post Concussive Syndrome, in NEUROPSYCHIATRY OF TRAUMATIC BRAIN INJURY 359 (Silver et.al.eds., American Psychiatric Press 1994). 4. 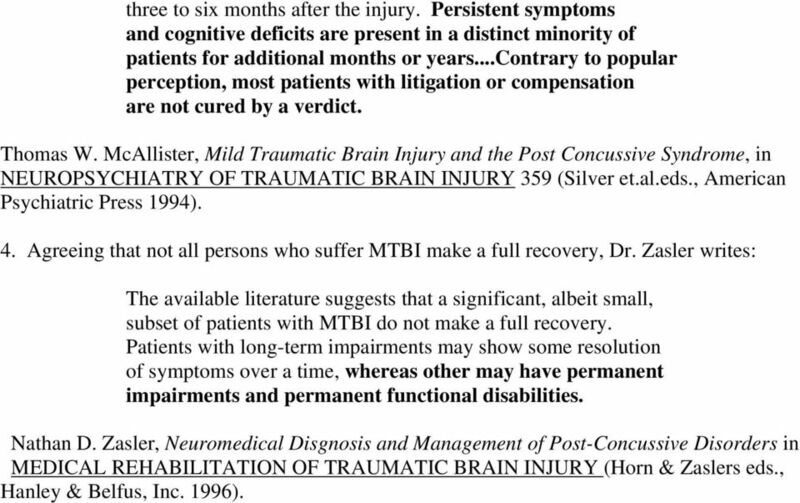 Agreeing that not all persons who suffer MTBI make a full recovery, Dr. Zasler writes: The available literature suggests that a significant, albeit small, subset of patients with MTBI do not make a full recovery. Patients with long-term impairments may show some resolution of symptoms over a time, whereas other may have permanent impairments and permanent functional disabilities. 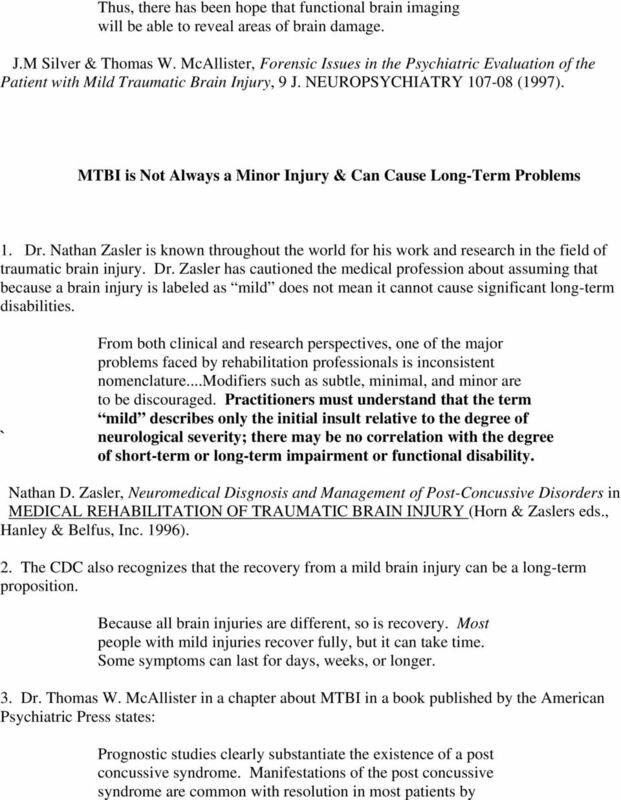 Nathan D. Zasler, Neuromedical Disgnosis and Management of Post-Concussive Disorders in MEDICAL REHABILITATION OF TRAUMATIC BRAIN INJURY (Horn & Zaslers eds., Hanley & Belfus, Inc. 1996). Sequence of Evidence and Witnesses in a Traumatic Brain Injury Case Sequence of Evidence and Witnesses in a Traumatic Brain Injury Case Who's on First? Princeton, New Jersey Trial Diplomacy Journal, Vol. Injury Law Center HEAD INJURY. Head injuries can be caused by car crashes, sports injuries, falls, workplace injuries and assaults. Page 1 of 7 Ben Brodhead on proving causation and damages in spinal fusion cases. Friend on Facebook Follow on Twitter Forward to a Friend Proving Causation and Damages in Spinal Fusion Cases By: Ben C.
brain injury take care of yourself. we ll take care of the rest. Concussion Recovery and Prevention: Neuroplasticity, Normal Concussion Course vs. Complicated Course. Roger Hartl, M.D. Kenneth Perrine, Ph.D.
TRANSPORT ACCIDENT LAW - TRAUMATIC BRAIN INJURY Traumatic Brain Injury ( TBI ) is a common injury in transport accidents. TBI s are probably the most commonly undiagnosed injuries in a hospital setting. Special Edition ACC News March 2011. This special edition of ACC News focuses solely on the Christchurch earthquake.